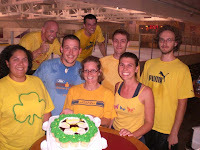 Despite our hu mble and skill-free beginnings as a soccer team, Tomorrow won the division championship! Woo-hoo...Free t-shirts for each of us! It was a shocking victory to everyone, especially the other team. I've got to give credit where credit is due - we couldn't have done it without our crazy-in-a-good-way goalie, Brad! Without him we'd be losers for sure. We'll test that premise next season since Brad and Laura have little loyalty and are deserting us to travel during their summer break. I am already anxiously awaiting their return to our team. 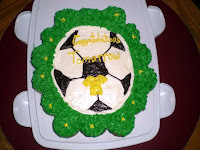 Because of our stellar success, Dave's wife made us congratulatory cupcakes! Mmmmm, sugar.